Add-ins are a great way to increase the functionality of Microsoft Office. Some add-ins are compatible with all Microsoft Office programs while others only work in specific applications such as the email client Microsoft Outlook or the presentation software Microsoft PowerPoint. 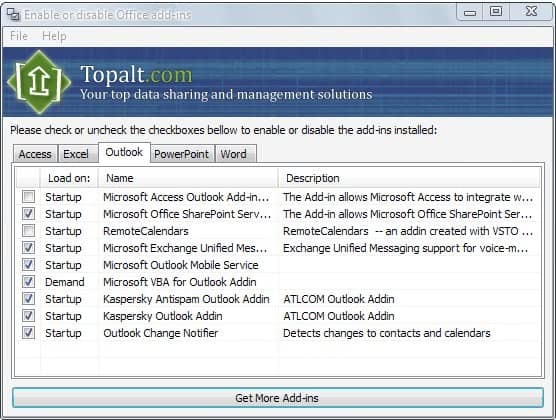 Microsoft Office does not however provide an easily accessible interface to manage all add-ins that are currently installed which is why Topalt's EnableDisable, a startup manager for Microsoft Office add-ins, might come in handy. Not all add-ins are needed all the time, and some even slow down the startup or performance of Microsoft Office programs. The Office add-in startup manager provides you with options to disable Microsoft Office add-ins comfortably. The program will display all add-ins, enabled or disabled, that are currently installed in Microsoft Office. It sorts the add-ins in tabs that refer to the Microsoft Office program that they are installed in. Displayed are tabs for Microsoft Access, Excel, Outlook, PowerPoint and Word. The listings has checkboxes, and lists the startup type of the individual add-in, its name and description. The Office add-in will be loaded if the checkbox is checked. All it takes to disable an add-in is to uncheck it in the program. EnableDisable might also come in handy to permanently disable add-ins in Microsoft Office in case they are not needed at all. All in all a very straightforward comfortable tool to manage Microsoft Office add-ins. Update: Enable Disable has been updated regularly. The latest version is fully compatible with all recent Microsoft Office versions including Office 2010 and Office 2013 and 32-bit and 64-bit versions of the programs. You can use the OfficeIns alternative by Nirsoft as well if you want a program that displays all add-ins in a single interface. Both programs are compatible with all recent (and not so recent) versions of Microsoft Office. Enabledisable is an easy to use program for Windows that takes care of all of your Office addin management needs. You can easily disable addins that slow down a particular program to speed it up. Nirsoft's program offers the advantage that you can change the startup type to on demand or on first time as well, which you cannot do with this program. Note that the program displays tabs for all installed Office components, so that yours may differ from the screenshot that you see above. Thanks for this Martin, I even discovered some add ins that I didn’t know about – sneaky google I think!